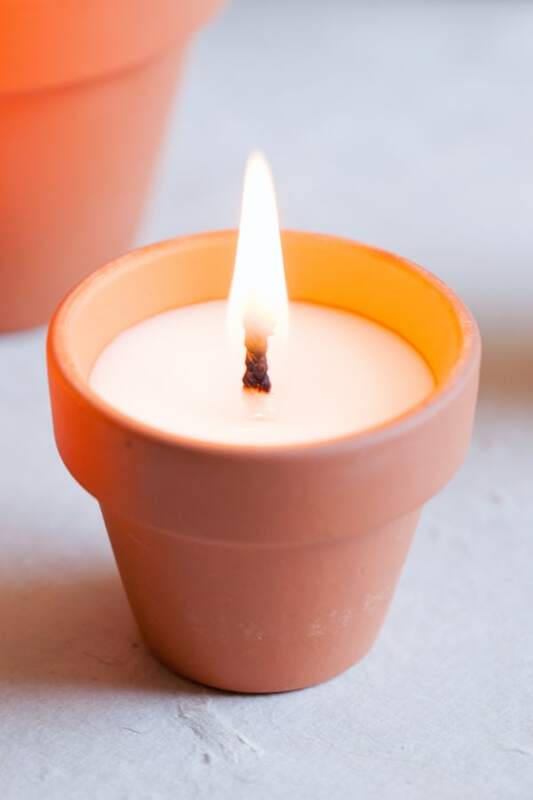 I saw this idea on Martha’s website and I had to make my own mini terra-cotta votives! Aren’t they adorable for fall entertaining?! You can make any size (even really large!) and add any scent to them. I think extra large ones would be a nice touch placed in the middle of a table or the small ones at individual place settings. 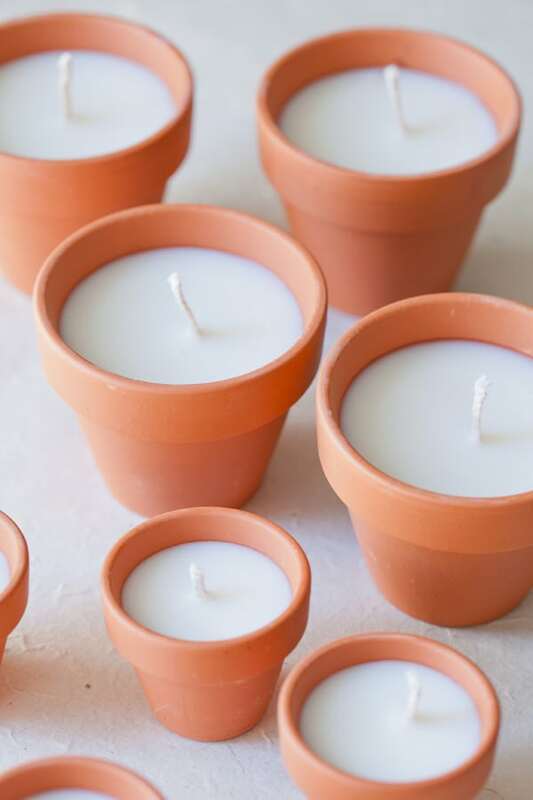 They’re also perfect for adding a beautiful, fall glow to an outdoor area. The tiny ones would make great wedding favors AND you can paint names on them too : ) I’m a little obsessed with these! 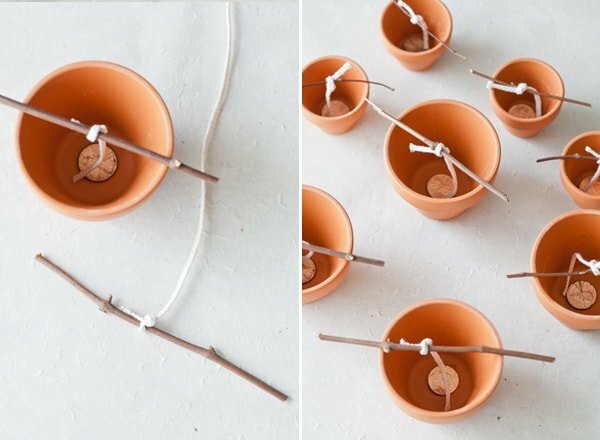 They were so simple to make and cheap too! I bought all of my supplies at Michaels. Place a penny in the bottom to close the hole. With the wick a loose know around the twig and cut so it fits nicely in the terracotta planter. Melt the wax and add any oils or scents you like. Pour into the planter. Make sure the wick is centered. 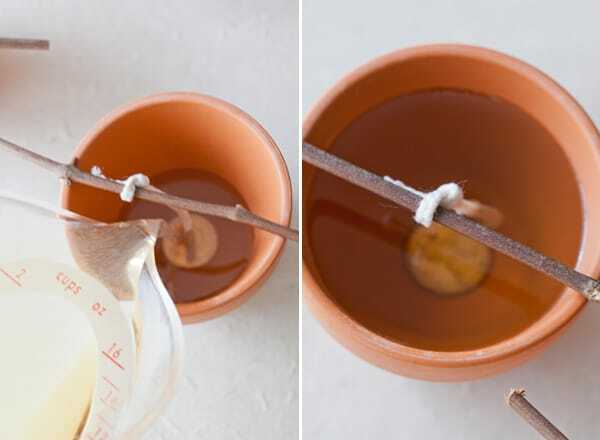 Let the wax harden then remove the twigs and cut the wick down to around 1/4 inch. adorable idea!!! candles are so expensive! I’m wondering if a color could be added? Food coloring maybe? You can add wax crayons or oil paint to give color..both works pretty well.. I tried the penny trick and wax still leaked out the bottom, I did a small batch of 3 first time around. Thank goodness I put them in a pan before I filled them, otherwise I would have had a very messy table. The remaining pots I put the wick up through the bottom and hot glued it in place. I also used modge podge on the inside to prevent the terra cotta from catching on fire, which was suggested on another site. Wax crayons aren’t good for coloring candles as its pigments will clog the wick preventing it from burning well. 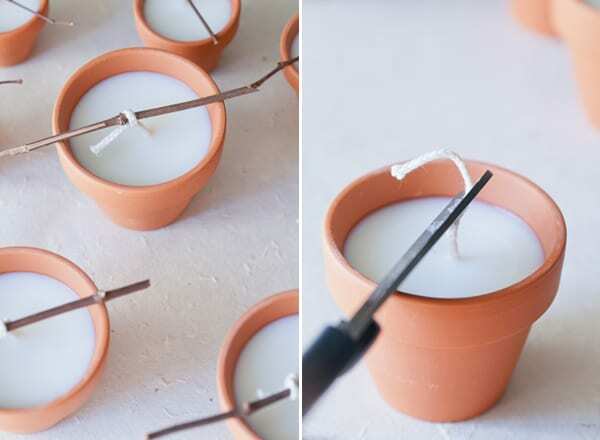 NEVER use oil paint to color a candle. Not only are the chemicals flammable, they are also toxic when burning. Food coloring is water based and won’t work. You need an oil soluble colorant. Just go to a craft store like Michael’s, Hobby Lobby or Joann’s and get some candle dye/colorant. These are amazing. I’m gonna have to try this next summer. Esta genial para toda ocasión felicidades por tan genial idea. Love these little candles. 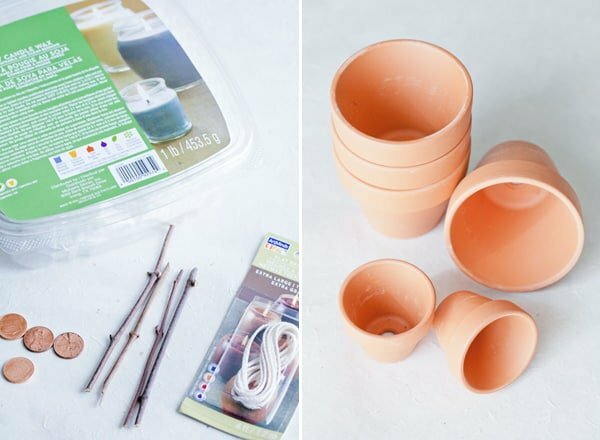 We sell the materials needed to make these including the terracotta pots in various sizes. Can you do it with regular wax? I like this idea! Very pretty n creative. Where do you buy the wax and wicks? Are they very expensive? We buy them at a local craft store. They’re not very expensive. Try adding a dot of hot wax under the penny first and let it cool before adding the other wax. Nice. It’s just so expensive to buy the main stuff. And you didn’t say how you poured the liquid wax I’m sure it would liquid trough the bottom hole. I love this idea!!!! Will be great as gifts and to use ourselves!! !